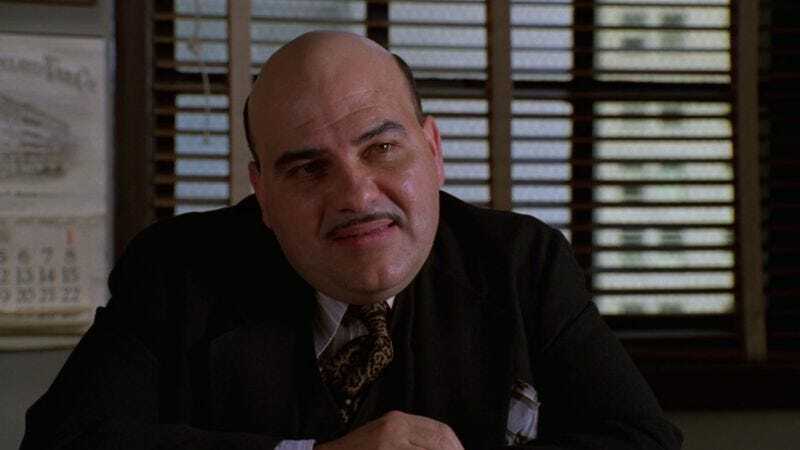 Jon Polito, the mustachioed, raspy-voiced character actor who squeezed both humor and surprising pathos from the many mobster and cop roles he played—most memorably for the Coen brothers—has died. The news was passed along by Polito’s friend, filmmaker John McNaughton, who directed Polito in the early episodes of Homicide: Life On The Street where Polito first earned attention as the pugnacious, philosophical Detective Steve Crosetti, as well as in the anthology series Masters Of Horror. No official cause of death has been given, though Polito was diagnosed with incurable blood cancer in 2010. Polito was 65. Providing a comprehensive overview of Polito’s incredibly prolific, 35-year career would be an impossible task; his work stretched from off Broadway to Broadway to cop dramas to sitcoms to short films to arthouse indies to big-budget family films to cartoon voiceovers, encompassing more than 200 credits. Anyway, there is IMDb and Wikipedia for that, while our own Nathan Rabin barely scratched the surface of Polito’s understandably crowded memories in a 2011 Random Roles. Suffice to say, any actor whose résumé includes Highlander, Miami Vice, The Rocketeer, The Crow, Roseanne, Seinfeld, Tales From The Crypt, Gilmore Girls, Flags Of Our Fathers, American Dad, Blankman, and It’s Always Sunny In Philadelphia—to name just a very few—has had a long, unusually varied career. Polito was a quintessential “that guy,” one of those idiosyncratic yet so familiar presences you were always pleasantly surprised to see blustering into even forgettable dross like, say, Veronica’s Closet. So let’s focus on the ones that counted most. Polito almost turned down his role on Homicide—the bleakly grounded, ahead-of-its-time cop drama set in David Simon’s unvarnished Baltimore—neither wanting to move to the city nor play the part they were offering. But he so impressed producers Barry Levinson and Tom Fontana with his audition that they rewrote the role to suit him, reimagining Detective Crosetti as a tough-yet-tenderhearted Italian who deeply loved his daughter, jazz, and God, and who was endlessly fascinated by the assassination of Abraham Lincoln. Unfortunately, network executives saw only the show’s dismal ratings, so after the second season Polito was pushed out to make room for the addition of Megan Russert. After Polito complained about it to the press, his hiatus became permanent, setting off an even nastier feud with Fontana after the show had Crosetti die ignobly off-screen in a suicide, one that—while arguably creating Homicide’s most memorable episode—was a frustrating and thoroughly undeserved resolution for the character. Fortunately, bygones were bygones by the time of Homicide: The Movie, and Crosetti was allowed to return in a glimpse of the afterlife, finally at peace. Polito’s work for the Coen brothers began, quite naturally, with 1990’s Miller’s Crossing, where the actor—who’d already racked up a decade’s worth of mob roles in stuff like The Gangster Chronicles and Crime Story—was a perfect match for the part of Johnny Caspar. With his deeply held beliefs in friendship, character, and ethics, his refusal to take the “high hat,” and his strict adherence to code among thieves, Caspar makes for an unusually sympathetic murderer, simply because he’s one of the few characters in the film who isn’t out to double-cross anyone. Polito’s also given some of the funniest, most pointed lines in a screenplay full of them—and he also gives you some of the greatest advice you’ll ever receive about shaving. When he wasn’t in the Coens’ company, of course, Polito still remained plenty busy, though their films had a huge impact in terms of Polito’s comic potential finally being recognized. While he continued to turn up in plenty of crime films and cop dramas, in the wake of his Coen movies, Polito also started bringing his intimidating yet oddly loveable energy to sitcoms like Dream On and Seinfeld (“Want me, love me, shower me with kisses!”). He also made good use of his voice—that gravelly, bulldog burr—in cartoons like Avatar: The Last Airbender and several animated Batman movies. That versatility allowed him to keep working steadily at a rate most actors would envy, completing as many as a dozen things per year even while in remission. A look at some of Polito’s final completed roles reflects his utility: another turn as Ed O’Neill’s estranged business partner on Modern Family; a grizzled detective on Comedy Bang! Bang! ; and voicing mob boss Carmine Falcone in the Batman: Arkham Underworld video game. He may have been frequently typecast as the gruff heavy, but there were few who could make those often-thankless roles sing like Jon Polito. And the fact that he has such a lengthy recorded history of doing it means we’ll probably still be pleasantly surprised to find him popping up in something we’re just now getting around to discovering, long after he’s gone.